Beginning later this week, South Korean travelers in Japan will be able to use the Kakao T taxi-hailing app to fetch taxis locally. The app is set to be interlinked with JapanTaxi, the biggest taxi-hailing company in Japan. 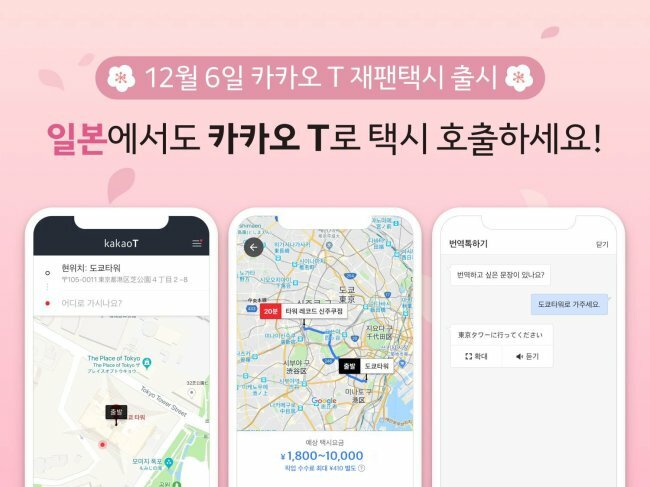 Starting Thursday, the option will become available on the Kakao T app, enabling users to hail taxis in Japan without additional registration procedures, said Kakao Mobility, the mobility business unit of Korea’s mobile-messaging giant Kakao. The service is not free -- a “call fee” will automatically be paid via the credit card registered on the app, on top of the regular taxi fare paid to the driver. Kakao is still determining the appropriate fee to charge, it said. The new service, equipped with a Korean-Japanese translation function, is expected to benefit the large number of Korean tourists who visit Japan every year, Kakao said. To access the new feature, users will need to download the updated version of the Kakao T app Thursday. Kakao plans to further interlink its services with the JapanTaxi app so that Japanese tourists in Korea can likewise call up taxis in Korea using the JapanTaxi app.